Led by columnist Henry Blodget (remember him?) 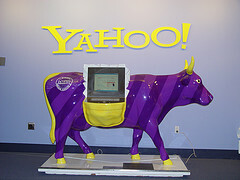 rumors abound this morning that Yahoo is considering layoffs of as much as 2,500 jobs in the next two weeks. This would represent between 15-20% of their workforce. Others are discussing similar rumblings. My take would be that this is not because of a worsening economy or even weaknesses in the tech or advertising sector. Yahoo has long been a company lacking direction, and the calls have been loud and long for them to make serious changes to their operations. Bottom line: Google took their lunch, ate it, and stole all their silverware as well (not to mention many of their best engineers). This is probably something that has to happen for Yahoo to find a new path. The “list” [of layoff targets] is reportedly the product of a Q4 project in which all group heads were asked to look at redundancies and create their own lists of potential cuts. All the group-level lists have now been turned in to corporate. The decision to go ahead with lay-off is said to be largely dependent on stock price: Yahoo’s stock trading in the low $20s has gotten Jerry’s and president Sue Decker’s attention.